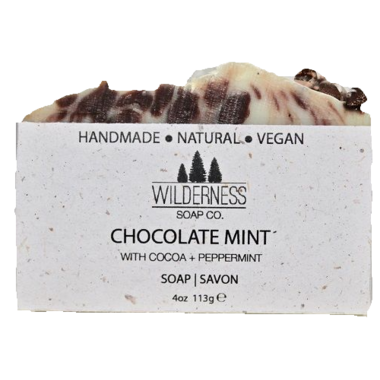 Wilderness Soap Co. Chocolate Mint Soap is as comforting as a bowl of mint chip ice cream, without the added sugar! Cooling peppermint combined with decadent cocoa butter will help to soothe and soften the driest of skin types. Ingredients: Olea Europaea (Olive) Fruit Oil, Aqua, Cocos Nucifera (Coconut) Oil, Theobroma Cacao (Cocoa) Seed Butter, Sodium Hydroxide, Oryza Sativa (Rice) Bran Oil, Ricinus Communis (Castor) Seed Oil, Theobroma Cacao (Cocoa) Powder, Mentha Piperita (Peppermint) Oil. Contains Nuts.